I worked with a lovely family whose home is near Lake Champlain. 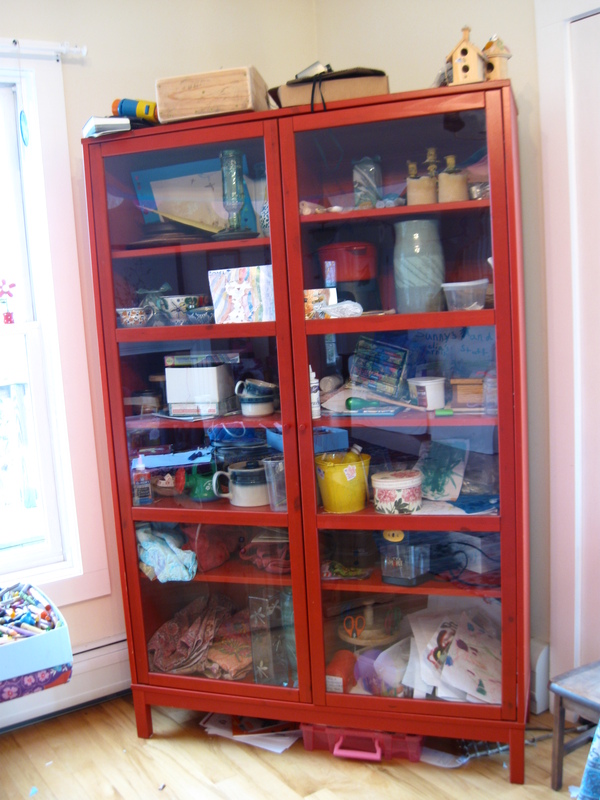 Our first task was with a free-standing red closet with doors. Mom Meg and I made sense of three young daughters’ art projects, placing all materials on low shelves, so they could get to them easily. We put table linens there, too. Dad Mike has made some wooden plates, so we displayed them vertically, along with ceramic pieces, candlesticks and candles on higher shelves, for safe keeping. Meg is attached to some of the girls’ art, so I suggested a changeable art gallery. 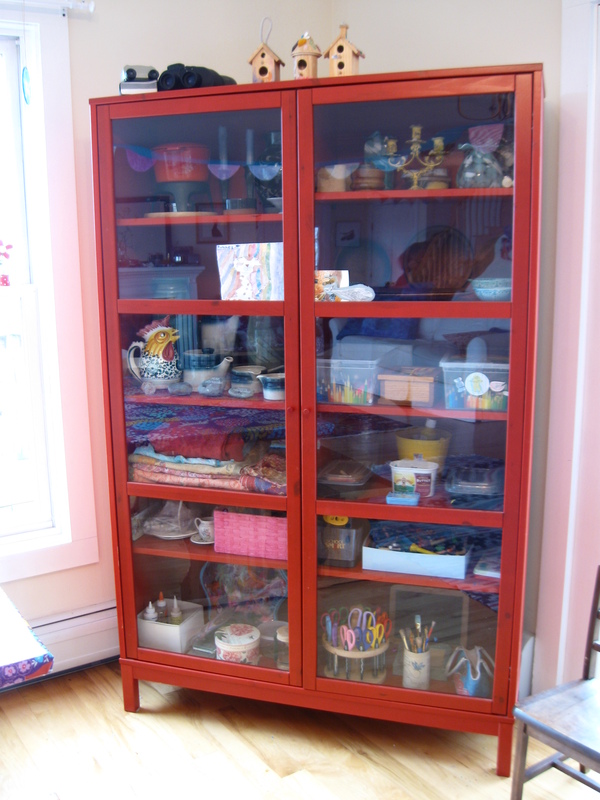 She could buy inexpensive lucite frames (the ones backed with cardboard “boxes” and finger holes) to preserve and display drawn, glued and other creations, made both at home and at school. I recommended using walls that everyone in the family sees many times each day. From Internet Search to Birthday Present! An email message appeared recently in my inbox. Heather’s signature showed that she’s a realtor/ home stager, with a 952 area code phone number. That’s the Minneapolis area! A bit tentatively, I wrote back that I’m in Vermont, not Minnesota. How might I help? She responded that she wanted to learn about my business, for a possible birthday present for her sister, who lives hereabouts. How did she hear about me? She googled professional organizers in the Burlington area. After a few more notes passed through cyberspace, she hired me for a session. Would I call her sister Heidi on her actual birthday to tell her about the gift and to arrange timing? Sure, this would be fun! We scheduled a Saturday afternoon session, which turned out to be cloudy and somewhat blustery – perfect for de-cluttering. Her daughter was home, though her husband and two sons were off for lunch and a movie. We opened up kitchen cupboards. I asked questions, including about what was bugging her most. 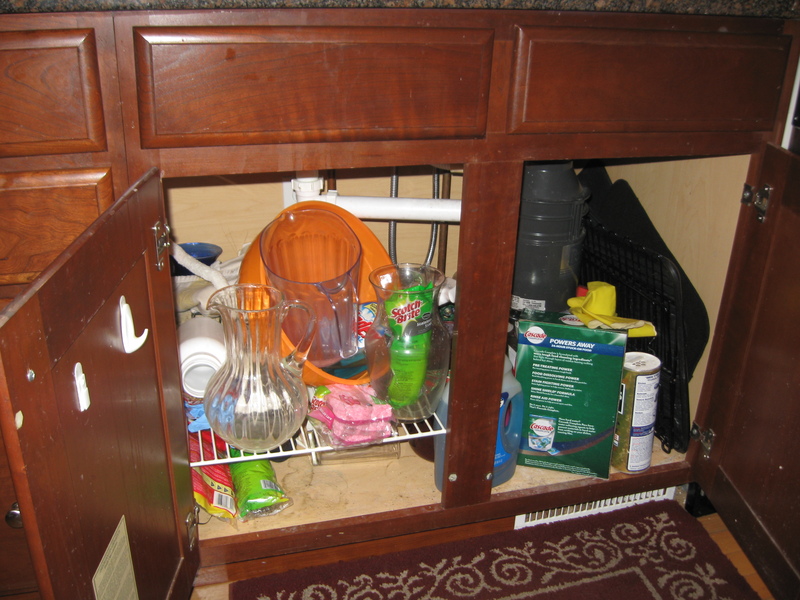 In the time available, we tamed below the sink and started on two other cupboards, consolidating cookbooks and moving some other items. We had lots of fun. Heidi worked hard and was pleased with her sister’s gift. For my part, I was tickled to “be” a birthday present, and was/am truly amazed to get this project from so far across the country! 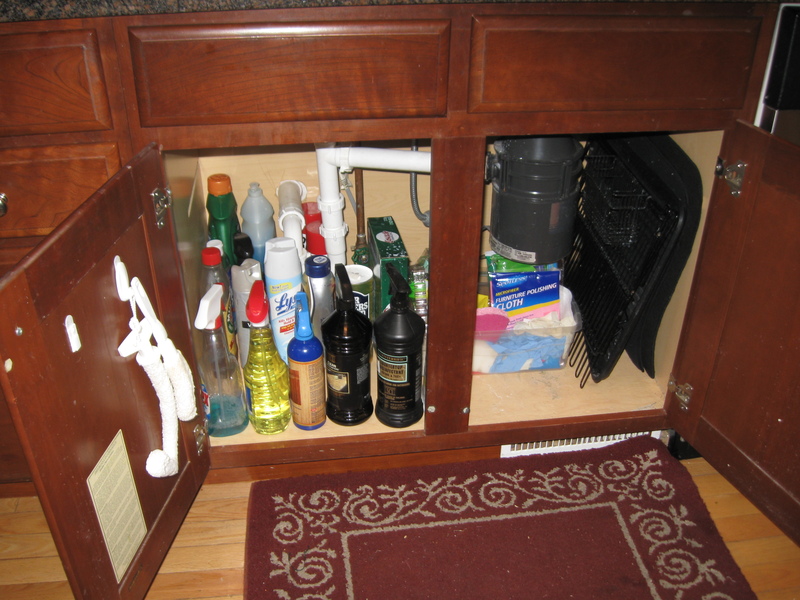 There was a last, small task for finishing under the sink. Heidi would buy a tension rod, for hanging cleaners from their handles to put unused upper inches to good advantage, and to free lower space for additional storage.